The Anker SoundBuds Slim Wireless Headphones have nearly 4,300 reviews on Amazon, and more than half of them are 5-star reviews. With that in mind, it’s a pretty safe bet that these are some damn good headphones. 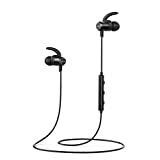 These fan favorites from Anker offer great sound and battery performance along with features you’d usually expect on much pricier earbuds, such as IPX5 sweat resistance and a magnetic clasp that keeps them secure around your neck with they’re not in your ears. These buds are a crazy value at $26, but the most popular color is on sale right now for just $20 and change. What’s In The Box: SoundBuds Slim, XS/S/M/L EarTips, S/M/L InEar-Hooks, FitClip, Shirt Clip, Micro USB Cable, Travel Pouch, welcome guide, our worry-free 18-month warranty and friendly customer service.